Postmodern architecture is a style or movement which emerged in the 1960s as a reaction against the austerity, formality, and lack of variety of modern architecture, particularly in the international style advocated by Le Corbusier and Ludwig Mies van der Rohe. The movement was introduced by the architect and urban planner Denise Scott Brown and architectural theorist Robert Venturi in their book Learning from Las Vegas. The style flourished from the 1980s through the 1990s, particularly in the work of Scott Brown & Venturi, Philip Johnson, Charles Moore and Michael Graves. In the late 1990s it divided into a multitude of new tendencies, including high-tech architecture, modern classicism and deconstructivism. In Italy at about the same time, a similar revolt against strict modernism was being launched by the architect Aldo Rossi, who criticized the rebuilding of Italian cities and buildings destroyed during the war in the modernist style, which had had no relation to the architectural history, original street plans, or culture of the cities. Rossi insisted that cities be rebuilt in ways that preserved their historical fabric and local traditions. Similar ideas were and projects were put forward at the Venice Biennale in 1980. The call for a post-modern style was joined by Christian de Portzamparc in France and Ricardo Bofill in Spain, and in Japan by Arata Isozaki. Robert Venturi (born 1925) was both a prominent theorist of postmodernism and an architect whose buildings illustrated his ideas. After studying at the American Academy in Rome, he worked in the offices of the modernists Eero Saarinen and Louis Kahn until 1958, and then became a professor of architecture at Yale University. One of his first buildings was the Guild House in Philadelphia, built between 1960 and 1963, and a house for his mother in Chestnut Hill, in Philadelphia. These two houses became symbols of the postmodern movement. He went on to design, in the 1960s and 1970s, a series of buildings which took into account both historic precedents, and the ideas and forms existing in the real life of the cities around them. Michael Graves (1934–2015) designed two of the most prominent buildings in the postmodern style, the Portland Building and the Denver Public Library. He later followed up his landmark buildings by designing large, low-cost retail stores for chains such as Target and J.C. Penney in the United States, which had a major influence on the design of retail stores in city centers and shopping malls. In his early career, he, along with the Peter Eisenman, Charles Gwathmey, John Hejduk and Richard Meier, was considered one of the New York Five, a group of advocates of pure modern architecture, but in 1982 he turned toward postmodernism with the Portland Building, one of the first major structures in the style. The building has since been added to the National Register of Historic Places. The most famous work of architect Charles Moore is the Piazza d'Italia in New Orleans (1978), a public square composed of an exuberant collection of pieces of famous Italian Renaissance architecture. Drawing upon the Spanish Revival architecture of the city hall, Moore designed the Beverly Hills Civic Center in a mixture of Spanish Revival, Art Deco and Post-Modern styles. It includes courtyards, colonnades, promenades, and buildings, with both open and semi-enclosed spaces, stairways and balconies. The Haas School of Business at the University of California, Berkeley blends in with both the neo-Renaissance architecture of the Berkeley campus and with picturesque early 20th century wooden residential architecture in the neighboring Berkeley Hills. Philip Johnson (1906–2005) began his career as a pure modernist. In 1935 he co-authored the famous catalog of the Museum of Modern Art exposition on the International Style, and studied with Walter Gropius and Marcel Breuer at Harvard. His Glass House in New Canaan, Connecticut (1949), inspired by a similar house by Ludwig Mies van der Rohe became an icon of the modernist movement. He worked with Mies on another iconic modernist project, the Seagrams Building in New York City. However, in the 1950s he began to include certain playful and mannerist forms into his buildings, such as the Synagogue of Port Chester (1954–56), with a vaulted plaster ceiling and narrow colored windows, and the Art Gallery of the University of Nebraska (1963). However, his major buildings in the 1970, such as IDS Center in Minneapolis (1973) and Pennzoil Place in Houston (1970–76) were massive, sober, and entirely modernist. With the AT&T Building (now named 550 Madison Avenue) (1978–82), Johnson turned dramatically toward postmodernism. The building's most prominent feature is a purely decorative top modeled after a piece of Chippendale furniture, and it has other more subtle references to historical architecture. His intention was to make the building stand out as a corporate symbol among the modernist skyscrapers around it in Manhattan, and he succeeded; it became the best-known of all postmodern buildings. Soon afterward he completed another postmodern project, PPG Place in Pittsburgh, Pennsylvania (1979-1984), a complex of six glass buildings for the Pittsburgh Plate Glass Company. These buildings have neo-gothic features, including 231 glass spires, the largest of which is 82 feet (25 m) high. In 1995, he constructed a postmodern gatehouse pavilion for his residence, Glass House. The gatehouse, called "Da Monstra", is 23 feet high, made of gunite, or concrete shot from a hose, colored gray and red. It is a piece of sculptural architecture with no right angles and very few straight lines, a predecessor of the sculptural contemporary architecture of the 21st century. Frank Gehry (born 1929) was a major figure in postmodernist architecture, and is one of the most prominent figures in contemporary architecture. After studying at the University of Southern California in Los Angeles and then the Harvard Graduate School of Design, he opened his own office in Los Angeles in 1962. Beginning in the 1970s, he began using prefabricated industrial materials to construct unusual forms on private houses in Los Angeles, including, in 1978, his own house in Santa Monica. He broke their traditional design giving them an unfinished and unstable look. His Schnabel House in Los Angeles (1986–89) was broken into individual structures, with a different structure for every room. His Norton Residence in Venice, California (1983) built for a writer and former lifeguard, had a workroom modeled after a lifeguard tower overlooking the Santa Monica beach. In his early buildings, different parts of the buildings were often different bright colors. In the 1980s he began to receive major commissions, including the Loyola Law School (1978–1984), and the California Aerospace Museum (1982–84), then international commissions in the Netherlands and Czech Republic. His "Dancing House" in Prague (1996), constructed with an undulating façade of plaques of concrete; parts of the walls were composed of glass, which revealed the concrete pillars underneath. His most prominent project was the Guggenheim Bilbao museum (1991–97), clad in undulating skins of titanium, a material which until then was used mainly in building aircraft, which changed color depending upon the light. Gehry was often described as a proponent of deconstructivism, but he refused to accept that or any other label for his work. While postmodernism was best known as an American style, notable examples also appeared in Europe. In 1991 Robert Venturi completed the Sainsbury Wing of the National Gallery in London, which was modern but harmonized with the neoclassical architecture in and around Trafalgar Square. The German-born architect Helmut Jahn constructed the Messeturm skyscraper in Frankfurt, Germany, a skyscraper adorned with the pointed spire of a medieval tower. One of the most visible examples of the postmodern style in Europe is the SIS Building in London by Terry Farrell (1994). The building, next to the Thames, is the headquarters of the British Secret Intelligence Service. The critic Deyan Sudjic in The Guardian in 1992 described it as an "epitaph for the 'architecture of the eighties. ... It's a design which combines high seriousness in its classical composition with a possible unwitting sense of humour. The building could be interpreted equally plausibly as a Mayan temple or a piece of clanking art deco machinery'. The Italian architect Aldo Rossi (1931–1997) was known for his postmodern works in Europe, the Bonnefanten Museum in Maastricht, the Netherlands, completed in 1995. Rossi was the first Italian to win the most prestigious award in architecture, the Pritzker Prize, in 1990. He was noted for combining rigorous and pure forms with evocative and symbolic elements taken from classical architecture. The Spanish architect Ricardo Bofill is also known for his early postmodern works, including a residential complex in the form of a castle with red walls at Culpe on the coast of Spain (1973). The works of Austrian architect Friedensreich Hundertwasser are occasionally considered a special expression of postmodern architecture. Isozaki Arata worked two years in the studio of Kenzo Tange, before opening his own firm in Tokyo in 1963. His Museum of Contemporary Art in Nagi artfully combined wood, stone and metal, and joined together three geometric forms, a cylinder, a half-cylinder and an extended block, to present three different artists in different settings. His Art Tower in Mito, Japan (1986-1990) featured a postmodernist aluminum tower that rotated upon its own axis. In addition to museums and cultural centers in Japan, he designed the Museum of Contemporary Art, Los Angeles (MOCA), (1981–86), and the COSI Columbus science museum and research center in Columbus, Ohio. 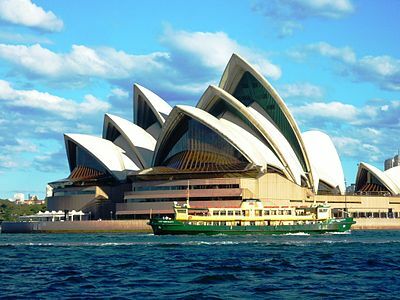 The Sydney Opera House in Sydney, Australia, by the Danish architect Jørn Utzon (1918–2008) is one of the most recognizable of all works of postwar architecture, and spans the transition from modernism to postmodernism. Construction began in 1957 but it was not completed until 1973 due to difficult engineering problems and growing costs. The giant shells of concrete soar over the platforms which form the roof of the hall itself. The architect resigned before the structure was completed, and the interior was designed largely after he left the project. The influence of the Sydney Opera House, can be seen in later concert halls with soaring roofs made of undulating stainless steel. One of the most influential buildings of the Postmodern period was the Berlin Philharmonic, designed by Hans Scharoun (1893-1972) and completed in 1963. The exterior, with its sloping roofs and glided façade, was a distinct break from the earlier, more austere modernist concert halls. The real revolution was inside, where Scharoun placed the orchestra in the center, with the audience seated on terraces around it. He described it this way: "The form given to the hall is inspired by a landscape; In the center is a valley, at the bottom of which is found the orchestra. Around it on all sides rise the terraces, like vineyards. Corresponding to an earthly landscape, the ceiling above appears like a sky." Following his description, future concert halls, such as the Walt Disney Concert Hall by Frank Gehry in Los Angeles, and the Philharmonie de Paris of Jean Nouvel (2015) used the term "vineyard style" and placed the orchestra in the center, instead of on a stage at the end of the hall. Complexity and Contradiction. The Neue Staatsgalerie by James Stirling in Stuttgart, Germany (1977-84). Postmodern architecture first emerged as a reaction against the doctrines of modern architecture, as expressed by modernist architects including Le Corbusier and Ludwig Mies van der Rohe. In place of the modernist doctrines of simplicity as expressed by Mies in his famous "less is more;" and functionality, "form follows function" and the doctrine of Le Corbusier that "a house is a machine to live in," postmodernism, in the words Robert Venturi, offered complexity and contradiction. Postmodern buildings had curved forms, decorative elements, asymmetry, bright colors, and features often borrowed from earlier periods. Colors and textures unrelated to the structure or function of the building. While rejecting the "puritanism" of modernism, it called for a return to ornament, and an accumulation of citations and collages borrowed from past styles. It borrowed freely from classical architecture, rococo, neoclassical architecture, the Viennese secession, the British arts and crafts movement, the German Jugendstil. Postmodern buildings often combined astonishing new forms and features with seemingly contradictory elements of classicism. James Stirling the architect of the Neue Staatsgalerie in Stuttgart, Germany (1984), described the style as "representation and abstraction, monumental and informal, traditional and high-tech." Postmodern architecture often breaks large buildings into several different structures and forms, sometimes representing different functions of those parts of the building. With the use of different materials and styles, a single building can appear like a small town or village. An example is the Staditsches Museum by Hans Hollein in Munich (1972–74). Asymmetric forms are one of the trademarks of postmodernism. In 1968 the French architect Claude Parent and philosopher Paul Virilio designed a church, Saint-Bernadette-du-Banlay in Nevers, France, in the form of a massive block of concrete leaning to one side. Describing the form, they wrote: "a diagonal line on a white page can be a hill, or a mountain, or slope, an ascent, or a descent." Parent's buildings were inspired in part by concrete German blockhouses he discovered on the French coast which had slid down the cliffs, but were perfectly intact, with leaning walls and sloping floors. Postmodernist compositions are rarely symmetric, balanced and orderly. Oblique buildings which tilt, lean, and seem about to fall over are common. Color is an important element in many postmodern buildings, to give the façades variety and personality sometimes colored glass is used, or ceramic tiles, or stone. The buildings of Mexican architect Luis Barragan offer bright sunlight colors that give life to the forms. 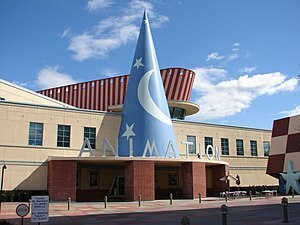 Humor is a particular feature of many postmodern buildings, particularly in the United States. An example is the Binoculars Building in the Venice neighborhood of Los Angeles, designed by Frank Gehry in collaboration with the sculptor Claes Oldenberg (1991–2001). The gateway of the building is in the form of an enormous pair of binoculars; cars enter the garage passing under the binoculars. "Camp" humor was popular during the postmodern period; it was an ironic humor based on the premise that something could appear so bad (such as a building that appeared about to collapse) that it was good. The American critic Susan Sontag in 1964 defined camp as a style which put its accent on the texture, the surface, and style to the detriment of the content, which adored exaggeration, and things which were not what they seemed. Postmodern architecture sometimes used the same sense of theatricality, sense of the absurd and exaggeration of forms. The aims of Postmodernism, which include solving the problems of Modernism, communicating meanings with ambiguity, and sensitivity for the building's context, are surprisingly unified for a period of buildings designed by architects who largely never collaborated with each other. These aims do, however, leave room for diverse implementations as can be illustrated by the variety of buildings created during the movement. The characteristics of postmodernism allow its aim to be expressed in diverse ways. These characteristics include the use of sculptural forms, ornaments, anthropomorphism and materials which perform trompe l'oeil. These physical characteristics are combined with conceptual characteristics of meaning. These characteristics of meaning include pluralism, double coding, flying buttresses and high ceilings, irony and paradox, and contextualism. The sculptural forms, not necessarily organic, were created with much ardor. These can be seen in Hans Hollein's Abteiberg Museum (1972–1982). The building is made up of several building units, all very different. Each building's forms are nothing like the conforming rigid ones of Modernism. These forms are sculptural and are somewhat playful. These forms are not reduced to an absolute minimum; they are built and shaped for their own sake. The building units all fit together in a very organic way, which enhances the effect of the forms. After many years of neglect, ornament returned. Frank Gehry's Venice Beach house, built in 1986, is littered with small ornamental details that would have been considered excessive and needless in Modernism. The Venice Beach House has an assembly of circular logs which exist mostly for decoration. The logs on top do have a minor purpose of holding up the window covers. However, the mere fact that they could have been replaced with a practically invisible nail, makes their exaggerated existence largely ornamental. The ornament in Michael Graves' Portland Municipal Services Building ("Portland Building") (1980) is even more prominent. The two obtruding triangular forms are largely ornamental. They exist for aesthetic or their own purpose. Postmodernism, with its sensitivity to the building's context, did not exclude the needs of humans from the building. Carlo Scarpa's Brion Cemetery (1970–72) exemplifies this. The human requirements of a cemetery is that it possesses a solemn nature, yet it must not cause the visitor to become depressed. Scarpa's cemetery achieves the solemn mood with the dull gray colors of the walls and neatly defined forms, but the bright green grass prevents this from being too overwhelming. Postmodern buildings sometimes utilize trompe l'oeil, creating the illusion of space or depths where none actually exist, as has been done by painters since the Romans. The Portland Building (1980) has pillars represented on the side of the building that to some extent appear to be real, yet they are not. The Hood Museum of Art (1981–1983) has a typical symmetrical façade which was at the time prevalent throughout Postmodern Buildings. Robert Venturi's Vanna Venturi House (1962–64) illustrates the Postmodernist aim of communicating a meaning and the characteristic of symbolism. The façade is, according to Venturi, a symbolic picture of a house, looking back to the 18th century. This is partly achieved through the use of symmetry and the arch over the entrance. Perhaps the best example of irony in Postmodern buildings is Charles Moore's Piazza d'Italia (1978). Moore quotes (architecturally) elements of Italian renaissance and Roman Antiquity. However, he does so with a twist. The irony comes when it is noted that the pillars are covered with steel. It is also paradoxical in the way he quotes Italian antiquity far away from the original in New Orleans. Postmodern architecture as an international style – the first examples of which are generally cited as being from the 1950s – but did not become a movement until the late 1970s and continues to influence present-day architecture. Postmodernity in architecture is said to be heralded by the return of "wit, ornament and reference" to architecture in response to the formalism of the International Style of modernism. As with many cultural movements, some of Postmodernism's most pronounced and visible ideas can be seen in architecture. The functional and formalized shapes and spaces of the modernist style are replaced by diverse aesthetics: styles collide, form is adopted for its own sake, and new ways of viewing familiar styles and space abound. Perhaps most obviously, architects rediscovered past architectural ornament and forms which had been abstracted by the Modernist architects. Postmodern architecture has also been described as neo-eclectic, where reference and ornament have returned to the façade, replacing the aggressively unornamented modern styles. This eclecticism is often combined with the use of non-orthogonal angles and unusual surfaces, most famously in the State Gallery of Stuttgart by James Stirling and the Piazza d'Italia by Charles Moore. The Scottish Parliament Building in Edinburgh has also been cited as being of postmodern vogue. Modernist architects may regard postmodern buildings as vulgar, associated with a populist ethic, and sharing the design elements of shopping malls, cluttered with "gew-gaws". Postmodern architects may regard many modern buildings as soulless and bland, overly simplistic and abstract. This contrast was exemplified in the juxtaposition of the "whites" against the "grays," in which the "whites" were seeking to continue (or revive) the modernist tradition of purism and clarity, while the "grays" were embracing a more multifaceted cultural vision, seen in Robert Venturi's statement rejecting the "black or white" world view of modernism in favor of "black and white and sometimes gray." The divergence in opinions comes down to a difference in goals: modernism is rooted in minimal and true use of material as well as absence of ornament, while postmodernism is a rejection of strict rules set by the early modernists and seeks meaning and expression in the use of building techniques, forms, and stylistic references. One building form that typifies the explorations of Postmodernism is the traditional gable roof, in place of the iconic flat roof of modernism. Shedding water away from the center of the building, such a roof form always served a functional purpose in climates with rain and snow, and was a logical way to achieve larger spans with shorter structural members, but it was nevertheless relatively rare in Modernist buildings. (These were, after all, "machines for living," according to LeCorbusier, and machines did not usually have gabled roofs.) However, Postmodernism's own modernist roots appear in some of the noteworthy examples of "reclaimed" roofs. For instance, Robert Venturi's Vanna Venturi House breaks the gable in the middle, denying the functionality of the form, and Philip Johnson's 1001 Fifth Avenue building in Manhattan (not to be confused with Portland's Congress Center, once referred to by the same name) advertises a mansard roof form as an obviously flat, false front. Another alternative to the flat roofs of modernism would exaggerate a traditional roof to call even more attention to it, as when Kallmann McKinnell & Wood's American Academy of Arts and Sciences in Cambridge, Massachusetts, layers three tiers of low hipped roof forms one above another for an emphatic statement of shelter. A new trend became evident in the last quarter of the 20th century as some architects started to turn away from modern functionalism which they viewed as boring, and which some of the public considered unwelcoming and even unpleasant. These architects turned toward the past, quoting past aspects of various buildings and melding them together (even sometimes in an inharmonious manner) to create a new means of designing buildings. A vivid example of this new approach was that Postmodernism saw the comeback of columns and other elements of premodern designs, sometimes adapting classical Greek and Roman examples (but not simply recreating them, as was done in neoclassical architecture). In Modernism, the traditional column (as a design feature) was treated as a cylindrical pipe form, replaced by other technological means such as cantilevers, or masked completely by curtain wall façades. The revival of the column was an aesthetic, rather than a technological necessity. Modernist high-rise buildings had become in most instances monolithic, rejecting the concept of a stack of varied design elements for a single vocabulary from ground level to the top, in the most extreme cases even using a constant "footprint" (with no tapering or "wedding cake" design), with the building sometimes even suggesting the possibility of a single metallic extrusion directly from the ground, mostly by eliminating visual horizontal elements—this was seen most strictly in Minoru Yamasaki's World Trade Center buildings. Another return was that of the "wit, ornament and reference" seen in older buildings in terra cotta decorative façades and bronze or stainless steel embellishments of the Beaux-Arts and Art Deco periods. In Postmodern structures this was often achieved by placing contradictory quotes of previous building styles alongside each other, and even incorporating furniture stylistic references at a huge scale. Contextualism, a trend in thinking in the later parts of 20th century, influences the ideologies of the postmodern movement in general. Contextualism is centered on the belief that all knowledge is "context-sensitive". This idea was even taken further to say that knowledge cannot be understood without considering its context. While noteworthy examples of modern architecture responded both subtly and directly to their physical context (analyzed by Thomas Schumacher in "Contextualism: Urban Ideals and Deformations," and by Colin Rowe and Fred Koetter in Collage City), postmodern architecture often addressed the context in terms of the materials, forms and details of the buildings around it—the cultural context. 125 London Wall (1992) by Terry Farrell and Partners aimed to "repair the urban fabric" of the district, dominated by post-Blitz modernist schemes. The Postmodernist movement is often seen (especially in the USA) as an American movement, starting in America around the 1960s–1970s and then spreading to Europe and the rest of the world, to remain right through to the present. In 1966, however, the architectural historian Sir Nikolaus Pevsner spoke of a revived Expressionism as being "a new style, successor to my International Modern of the 1930s, a post-modern style", and included as examples Le Corbusier's work at Ronchamp and Chandigarh, Denys Lasdun at the Royal College of Physicians in London, Richard Sheppard at Churchill College, Cambridge, and James Stirling's and James Gowan's Leicester Engineering Building, as well as Philip Johnson's own guest house at New Canaan, Connecticut. Pevsner disapproved of these buildings for their self-expression and irrationalism, but he acknowledged them as "the legitimate style of the 1950s and 1960s" and defined their characteristics. The job of defining Postmodernism was subsequently taken over by a younger generation who welcomed rather than rejected what they saw happening and, in the case of Robert Venturi, contributed to it. The aims of Postmodernism or Late-modernism begin with its reaction to Modernism; it tries to address the limitations of its predecessor. The list of aims is extended to include communicating ideas with the public often in a then humorous or witty way. Often, the communication is done by quoting extensively from past architectural styles, often many at once. In breaking away from modernism, it also strives to produce buildings that are sensitive to the context within which they are built. Postmodernism has its origins in the perceived failure of Modern architecture. Its preoccupation with functionalism and economical building meant that ornaments were done away with and the buildings were cloaked in a stark rational appearance. Many felt the buildings failed to meet the human need for comfort both for body and for the eye, that modernism did not account for the desire for beauty. The problem worsened when some already monotonous apartment blocks degenerated into slums. In response, architects sought to reintroduce ornament, color, decoration and human scale to buildings. Form was no longer to be defined solely by its functional requirements or minimal appearance. The creation of these programs was paralleled by the hiring, in the 1970s, of professionally trained historians by schools of architecture: Margaret Crawford (with a PhD from UCLA) at SCI-Arc; Elisabeth Grossman (PhD, Brown University) at Rhode Island School of Design; Christian Otto (PhD, Columbia University) at Cornell University; Richard Chafee (PhD, Courtauld Institute) at Roger Williams University; and Howard Burns (MA Kings College) at Harvard, to name just a few examples. A second generation of scholars then emerged that began to extend these efforts in the direction of what is now called "theory": K. Michael Hays (PhD, MIT) at Harvard, Mark Wigley (PhD, Auckland University) at Princeton (now at Columbia University), and Beatriz Colomina (PhD, School of Architecture, Barcelona) at Princeton; Mark Jarzombek (PhD MIT) at Cornell (now at MIT), Jennifer Bloomer (PhD, Georgia Tech) at Iowa State and Catherine Ingraham (PhD, Johns Hopkins) now at Pratt Institute. Postmodernism with its diversity possesses sensitivity to the building's context and history, and the client's requirements. The postmodernist architects often considered the general requirements of the urban buildings and their surroundings during the building's design. For example, in Frank Gehry's Venice Beach House, the neighboring houses have a similar bright flat color. This vernacular sensitivity is often evident, but other times the designs respond to more high-style neighbors. James Stirling's Arthur M. Sackler Museum at Harvard University features a rounded corner and striped brick patterning that relate to the form and decoration of the polychromatic Victorian Memorial Hall across the street, although in neither case is the element imitative or historicist. Following the postmodern riposte against modernism, various trends in architecture established, though not necessarily following principles of postmodernism. Concurrently, the recent movements of New Urbanism and New Classical Architecture promote a sustainable approach toward construction, that appreciates and develops smart growth, architectural tradition and classical design. This in contrast to modernist and globally uniform architecture, as well as leaning against solitary housing estates and suburban sprawl. Both trends started in the 1980s. The Driehaus Architecture Prize is an award that recognizes efforts in New Urbanism and New Classical Architecture, and is endowed with a prize money twice as high as that of the modernist Pritzker Prize. Some postmodern architects, such as Robert A. M. Stern and Albert, Righter, & Tittman, have moved from postmodern design to new interpretations of traditional architecture. Neo-Historism, a reference style to historical architecture, emerged from Postmodernism. It attempts at creating more accurate references of historical architecture styles. ^ Hopkins 2014, p. 200. ^ Ghirardo & 19997, p. 18. ^ Ghirardo & 19997, p. 17. ^ Ghirardo & 19997, pp. 17–23. ^ a b Taschen 2016, p. 638. ^ Taschen 2016, pp. 314-317. ^ a b Taschen 2016, p. 317. ^ Taschen 2016, pp. 220–223. ^ De Bure 2015, p. 48. ^ Taschen 2016, p. 604). ^ Prima 2006, p. 353. ^ Taschen 2016, pp. 24-27. ^ Taschen 2016, pp. 304-305. ^ Taschen 2016, p. 634. ^ De Bure 2015, p. 160. ^ De Bure, 2015 & pages 47-49. ^ Hopkins 2014, p. 202. ^ Hopkins 2014, pp. 200-201. ^ De Bure 2015, p. 161. ^ Hopkins 2014, p. 203. ^ Nesbitt, Kate (1996). Theorizing A New Agenda for Architecture: An Anthology of Architectural Theory 1965-1995. New York: Princeton Architectural Press. p. 294. ISBN 1-56898-053-1. ^ a b McAlester, Virginia Savage (2013). A Field Guide to American Houses. Alfred A. Knopf. pp. 664–665, 668–669. ISBN 978-1-4000-4359-0. ^ Mark Jarzombek, "The Disciplinary Dislocations of Architectural History," Journal of the Society of Architectural Historians 58/3 (September 1999), p. 489. See also other articles in that issue by Eve Blau, Stanford Anderson, Alina Payne, Daniel Bluestone, Jeon-Louis Cohen and others. ^ Caniglia, Julie (December 1999). "Cathedral of Hope". Out. Here Publishing: 46. ISSN 1062-7928. Ghirardo, Diane (1996). Architecture after Modernism. Thames and Hudson. ISBN 2-87811-123-0. Wikimedia Commons has media related to Postmodern architecture.